Last year, over 4,000 clubbers descended on a converted steel works in Sheffield for a night of hedonistic hard dance clubbing. The new album - Magna The Homecoming: Live - is a celebration of that night and was recorded live at the event. Disc 1 features the European industrial sounds of Lab 4 and includes exclusive re-edits of Candyman, Concept Of Love, and Requiem along with brand new material. Disc 2 showcases the Tidy debut of international trance artists Agnelli & Nelson and Solarstone and includes tracks from Giuseppe Ottaviani, Armin van Buuren, Sean Tyas, Simon Patterson, and John O�Callaghan played during the set. Disc 3 is all about hard dance fanatic Rob Tissera and his trademark sound, which is guaranteed to satisfy the demanding Tidy faithful. 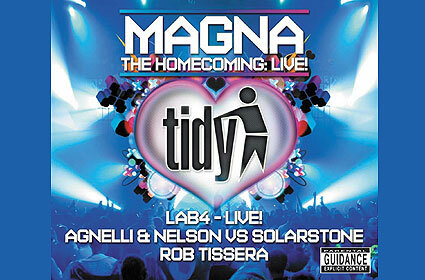 Magna The Homecoming Live is released on Monday 27 April.